Dancing in the Rain: PYHO: Leaving.... & WTF? I have been debating with myself about writing this post. On the one hand, I don't want to dwell on my fears and anxieties, but on the other hand, I don't want to pretend they don't exist. That will only make me think about them more, hence dwelling. It always helps me to get stuff out. 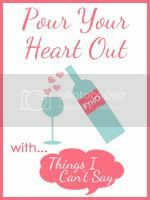 And Pour Your Heart Out Wednesday with Shell at Things I Can't Say just screams "write the post, Jennifer!". As you may recall from my post last week, Happy (if you don't shame on you), my kids and I are taking a trip to Lake Tahoe next month. I am very happy about this! It has been way too long since I've been - 7 years - and my little boy has never been. AJ hasn't even met his great-grandmother, nor any other family on my mom's side besides my mom and step-dad. Also, we have the opportunity to see my kids' Godmother JHo and her family, who we haven't seen since AJ was 3 months old. The time is at hand and it's definitely awesome and I am SO grateful! However, the reason I haven't been back for so long is my husband. Mark is on dialysis and while you can travel and visit another clinic, Tahoe doesn't have any. Last time I took Camryn and spent 10 days there, I felt horribly guilty the entire time and thought I'd never want to do it again. It's not fair and it kind of really pisses me off. Over the last 7 years Mark and I (and my mom) have talked about it, mulled it over, yadda yadda. My mom and step-dad have come here several times for visits and have had Camryn visit them once she was old enough to fly as an unaccompanied minor. I haven't been willing to leave Mark for the past 7 years. Actually, I wanted to last year, but my mom was being weird that time. But if I'm being completely honest, my reasons are not only due to unfairness or guilt. We have been through the wringer with Mark and his health problems. SO much has happened and it has all affected me deeply. I am traumatized and full of fear and anxiety. In my mind, I am the only one who can make sure Mark is OK. I'm the only one who can take care of him well because I know and love him best. I have developed a sixth sense when it comes to low blood sugars. I often know before he does. Mark downplays his condition to other people all the time. Only I know how he really is, if he's struggling, just alright or doing really well. I nag him about things I think he needs to pay attention to, and while he doesn't like it, he will listen to me. He's not real big on other people's opinions. He's a stubborn man. I figure as long as I'm with him, or at least close by, everything will be OK. Even it it's not OK, at least I was here. I dread the idea that something bad will happen to him while I'm 2 states away living it up. That no one else will know how to help, I won't be able to get to him..... And how horrible would that feel?? So I just won't do it. That's fine, I'm willing to sacrifice Tahoe for Mark. It's not fair anyway, right? (Can you tell I have a strong sense of fairness?) If he can't go, I won't go, and that's that. But it's not that simple. There are things like maybe NOT being a martyr. Not making Mark feel guilty that he's holding the kids and I back from something really special. Perhaps trying not to be a control freak and trying not to think the worst will happen just because I'm elsewhere. And how about not hurting my mother by keeping her from sharing the things she loves with her grandchildren? And most importantly, how about not living in fear? When my mom first told me she wanted us to do this, I literally panicked. I don't have full-on panic attacks, the kind that feel like a heart attack. But it was enough to make me a little shaky and do a little crying. I called my friend Jessica to talk this out with her and was so surprised to find myself crying at her. Gawd! Seriously? She of course wasn't surprised because she knows how traumatized I am. But oh, it made me so mad! Not Jess, me, my stupid fears. So yes, leaving Mark home alone for a week scares me. And yes, he's a grown man and he CAN take care of himself. And no, probably nothing even remotely terrible will happen in my absence. (From my fingers to God's ears!) Mark wants us to go and promises he will take good care of himself. He's looking forward to having a break too, even if it's just here at home. We're actually jealous of each other. I'd love to spend a week at home alone and he'd love to go to Tahoe. What's that people say about having cake and eating it too? Now, I want to end this post with a little levity. I've been having fun reading other people's WTF Wednesday posts but wasn't finding many things that I thought would qualify to post myself. But today I have something. Or at least it makes me think WTF?? Crown Royal Cask No. 16 remains the Rolex Sports Car Series presenting sponsor and is the exclusive whisky of GRAND-AM." Um. Does it strike anybody else as absurd that a hard liquor company is a race car sponsor? Mark was watching a race on TV at Laguna Seca last week and I thought, wow, that's really funny. Yes, I know beer companies also do it. That's absurd too. Way to teach people not to drink and drive! I hope you have an amazing time on your trip! It is good that you are going, but I understand the fear about leaving your husband. Whatever is going to happen is part of God's plan for you. Let go and trust Him. Can't wait to hear how your trip goes! And my WTF moment for the day is REALLY?!? Tahoe doesn't have a dialysis clinic or a doctor who can do it in his clinic?!? How is that even possible?!? I hope you have a wonderful time on your trip! Your family will probably be so excited that you have come to see them. I can understand how you would be so torn! But, I think that you probably deserve a break and vacation. :) Hugs and enjoy your trip . . . Stopping by from PYHO . . . I found your blog through Theta Mom, nut I'm surprised I never found you through PYHO. I usually post over there on Wednesdays too. I can understand your insecurities about leaving your husband. I am control freak too and it's hard to let go even though you really want to enjoy yourself. Don't fell guilty. You'll enjoy yourself. I'm sure you feel better getting this off your chest. Jennifer, I can totally understand your fear of leaving your husband. I would be the same. You have to do what you feel comfortable with. Don't let anyone make you do something you don't. Ultimately, you should decided otherwise you're not going to enjoy yourself no matter what you decide to do. I completely understand how you feel about not wanting to leave Mark's side. I'd be the same way if it were me. Just do what you feel comfortable with. Don't let others pressure you into leaving your comfort zone. And alcohol sponsoring cars? Yeah, that's a WTF! I have done plenty of mothering of my husband. Learning to turn that off is tough. Especially enough to leave town. I hope you have a wonderful time and that both you and your husband grow from this experience. I love Tahoe! I miss it so much. My grandparents had a cabin in Tahoma that is now my aunts. Anyway it's been 4 years since I've been over Donner pass and pack home to California. I should go again someday. I hope you have a great time!